In the three years since its launch, Rock for HAWC has quickly become a treasured, local-music-focused tradition on the North Shore. First established in 2015 by Radio Compass singer Angela Lee, each iteration of the annual concert raises money for Healing Abuse, Working for Change, a domestic violence agency in Salem, Massachusetts. This year, with both a music compilation for sale and a quasi-expansion at Koto, the fundraiser’s rumble is only growing louder. 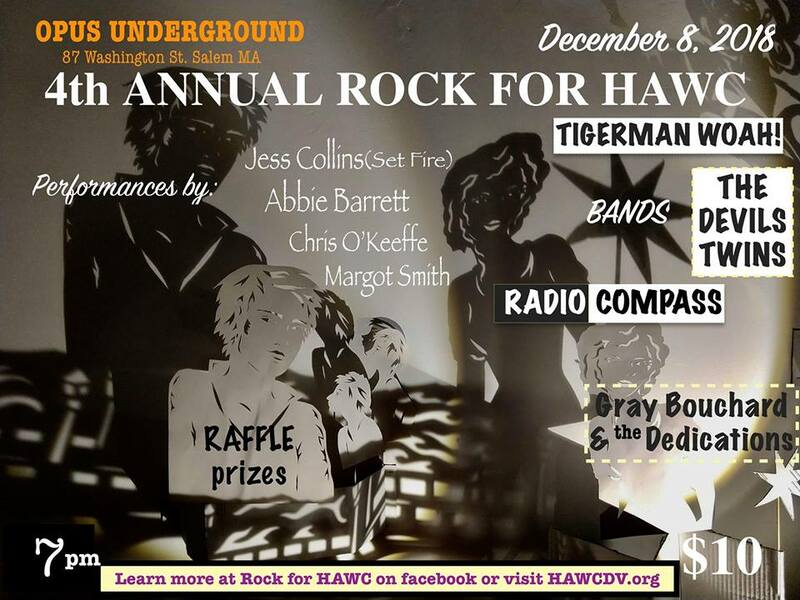 Now nicknamed “Rock the Block for HAWC,” the event kicks off Saturday (December 8) at Opus in Salem with a two-part bill of acoustic sets and band performances. The acoustic portion kicks off at 7 p.m., featuring Jess Collins (of Set Fire), Chris O’Keeffe, Margo Smith (of Trashmonster and Bad Larrys), and Abbie Barrett. Later in the evening, Radio Compass, Gray Bouchard and the Dedications, The Devil’s Twins, and Tigerman WOAH each take the stage starting at 9:30 p.m.. Tickets are $10 each, and the money raised from the show will be distributed evenly between donations to HAWC and compensation for the performers. Across the street at Koto, the Sirens: Women In Music showcase will collect donations of items like bedding, gift bags, toiletries, and hygiene products to give to the women’s shelter at HAWC. A limited number of joint access passes that allow guests to go back and forth between the two gigs will be available for $14. As opposed to previous years, the 2018 edition of Rock for HAWC will have a compilation CD for sale in lieu of calendars, a move Lee says keeps music more central to the event. 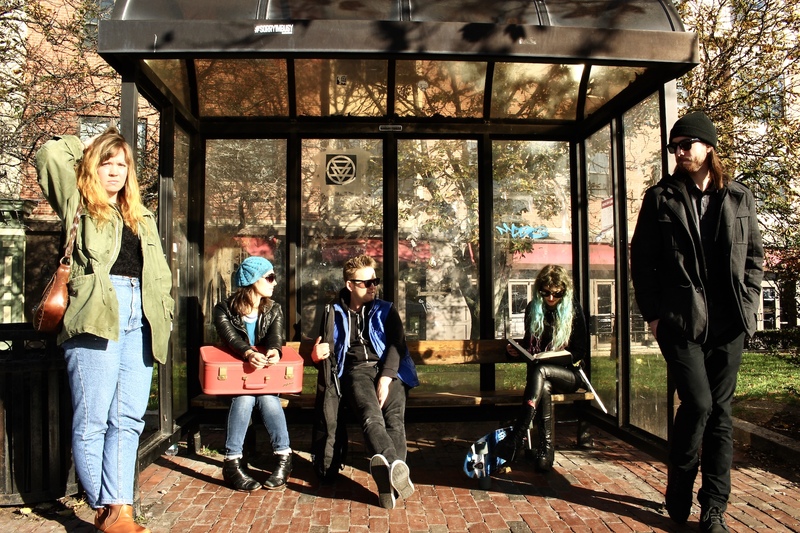 The 12 tracks, all mastered by Richard Marr of Galaxy Park Studios in Salem, include music from Margo Smith (of Bad Larrys and TrashMonster), Carissa Johnson, Abbie Barrett, I Was Awake, Em Higgins (of Bad Larrys), Gretchen Shae (of The Knock Ups), Nicole Coogan (of The Devil’s Twins), Myra Broderick (of The Evil Streaks), Dori Cameron and the Invisible Monsters, The Away Games, Dogwood & Elm, and Lee herself. The digital version of the record will be available on December 8, while attendees can pick up hard copies of the album at the show. All of the money raised from album sales will be donated directly to HAWC. According to Lee, the “stripped” theme isn’t some random coffeehouse approach; Both the musical style and the album’s imagery are meant to represent the healthy (although sometimes daunting) transitions that HAWC provides people seeking safety from domestic abuse.